Roughly eight and a half miles separate Winter Park from the University of Central Florida campus in east Orlando. But the route is rich with football history, from Division III UCF’s first snap against tiny St. Leo three decades ago to the university’s subsequent emergence as an upstart Football Bowl Subdivision powerhouse that claimed a mythical national championship for the 2017 season. The Knights, you’ll recall, went unbeaten in the 2017 regular season and then whipped Auburn in the Peach Bowl. The Tigers had been the only team to beat both Alabama and Georgia, who were paired against one another for the official national championship in Atlanta. Orlando’s Hometown Team — seething over the perceived unfairness of the College Football Playoff system and eager to show that its success was no fluke — went unbeaten again in the 2018 season, only to fall to LSU in the Fiesta Bowl. It was the team’s first loss in two years. Say what you will about the playoff selection process and about that national championship hype fest. Everyone, it seems, has an opinion. Don Jonas (right), previously quarterback of the American Football League’s Orlando Panthers, coached the first season of UCF football gratis. The program was rescued from financial ruin a few years later when Winter Park businessman Steve Slack (left) implemented a series of raucous fundraising events. But the fact that UCF was even in the conversation demonstrated how far the program had come since 1979, when a then-remote commuter school assembled a ragtag band of nonscholarship scrappers and set its sights on one day going helmet to helmet with college football’s elites. Winter Park can take a collective bow and celebrate its role in helping UCF’s gridiron dream become a reality. In 1979, the Knights had no locker room, players had to bring their own cleats and equipment was donated. Head coach Don Jonas, one-time quarterback of the American Football League’s Orlando Panthers, worked the first season gratis. Home games were played in the Tangerine Bowl (today Camping World Stadium) in downtown Orlando. Today, UCF’s on-campus Kenneth G. Dixon Athletics Village is anchored by Spectrum Stadium, which seats 44,206. The village is undergoing a $25 million, privately funded expansion program that will include a resort-style lazy river and mini-golf course alongside the stadium. Indeed they did. And the who matters just as much as the how. It’s easy to remember such high-profile players as quarterbacks Daunte Culpepper and Blake Bortles as well as tailback Marquette Smith, who set the school’s single-season record for rushing yards as a senior. More recently linebacker Shaquill Griffin, an amputee with one hand, received national media attention when he was drafted by the NFL’s Seattle Seahawks. Who hasn’t gotten goosebumps from Griffin’s inspirational Gillette TV commercial? The best a man can get, indeed. It gets more challenging to connect the dots to other players, many of them lesser-known, who made that short journey from Winter Park to UCF. So let’s raise a glass to the 25 locals — including Brandon Marshall (wide receiver), Michael O’Shaughnessy (defensive lineman) and All-American Darin Slack (quarterback) — who have donned a Knights uniform. Marshall played with several NFL teams and is currently a free agent. O’Shaughnessy owns a Winter Park-based real estate brokerage company, while Slack is founder and president of National Football Academies — which in recent years has expanded to Europe. And let’s not forget other Winter Parkers who have walked on, including current players Kyle Benkel (wide receiver) and Alec Holler (tight end). Benkel played at Winter Park High School while Holler played at Trinity Prep. 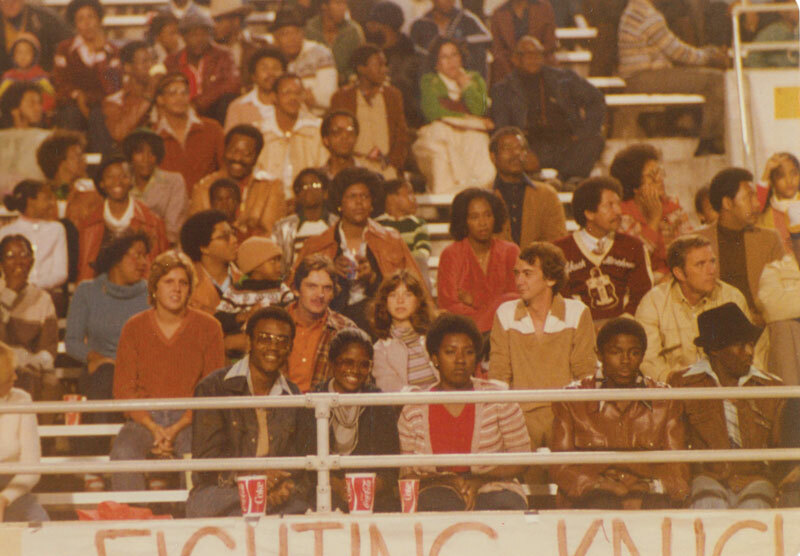 UCF’s final game of the first season was against Morehouse College. 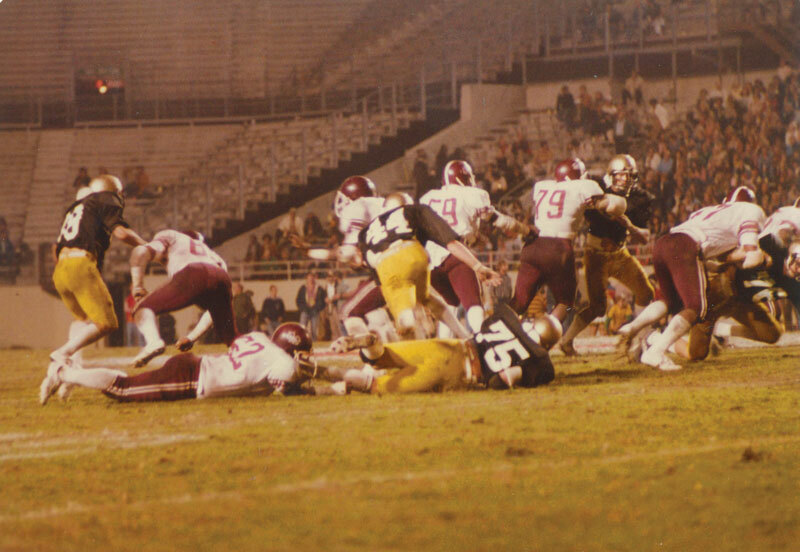 More than 13,000 fans watched a defensive struggle in which the Knights ground out a 14-7 win over the Maroon Tigers. UCF finished the season 6-2, and along the way set a Division III attendance record at its first home game against Fort Benning. More than 14,000 fans showed up at the Tangerine Bowl to see the Knights earn a tough 7-6 win over the Doughboys. And a moment of silence, please, for Jaime Lugo, who quarterbacked the Wildcats to the state finals in 1981 and was under center for UCF when the program made the painful leap to Division II in 1982. Lugo, who had been branch manager for a chain of tire stores, died in February at just 54. UCF’s football program also helped to develop a pair of Winter Park High School coaches. 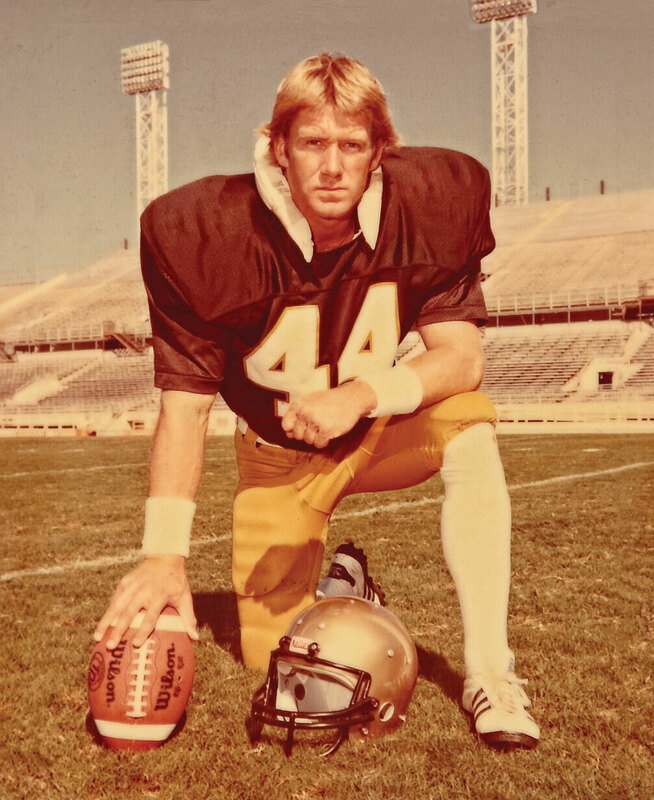 Tim Shifflet, now head coach of the Wildcats, was briefly an all-purpose assistant at UCF. Paul Lounsberry, a recently retired assistant on Shifflet’s staff, coached the offensive line at UCF for 12 years. Winter Park businesspeople did their share. Among the most notable was Steve Slack — father of the former quarterback — who rode to the rescue in the mid-’80s, when the UCF athletic department found itself $1 million in debt and some in the community were calling for the football program to be dismantled. Slack, owner of a specialty advertising company, helped launch a series of annual fundraisers that featured sports-related auctions. Thanks in part to proceeds from those events — dubbed “Gene’s Gatecrasher!” in honor of then-head coach Gene McDowell — the athletic department retired its debt in 1986. It was just another day at the office for the inventive Slack, who in 1978 had dreamed up the wildly successful “Zonies!” package when the old Tangerine Bowl was having trouble selling end-zone seats for its annual football game. He died in 2016, leaving Central Florida a less interesting place. So many stories. We can’t tell them all, but we can provide you with glimpses into the past through some of the names and faces who can proudly make the connection between Winter Park and UCF. Let’s cut through some generational ties and grab a glimpse of history, context and local pride. The fledging UCF football program welcomed all comers to the program as it prepped for its inaugural season. Bouncers, fighters and misfits included. Come on down, Michael O’Shaughnessy, who had dropped out of Winter Park High School in the 10th grade and later earned an AA from Seminole Community College (now Seminole College). He enrolled at UCF, where he joined the baseball team as a catcher and left fielder. O’Shaughnessy was working as a bouncer at Sam’s Woodshed Pub and Rosie O’Grady’s when he joined 196 other guys for an open cattle call for players in the spring of 1979. There weren’t a lot of perks. No scholarships, although Pell Grants could help ease the financial strain. Everybody brought their own cleats and socks, which made for a colorful display of diversity if you looked below the knees. O’Shaughnessy even brought his own helmet, which he had used in the eighth grade. Speaking of weeds, players also famously got to lay sod on the practice field, which had been a golf driving range. Those who made the cut hung on to become a part of history when the Fighting Knights, now coached by Jonas, beat the St. Leo University Monarchs 21-0 on a rain-soaked cow pasture near Dade City. The team went on to finish 6-2 and averaged 11,000 fans per home game — huge for a Division III program. Winter Parkers Tony and Sonja Nicholson have been crucial supporters of UCF football, donating $2 million for construction of the Nicholson Fieldhouse, the state’s first indoor practice facility for a college football team. In 2017, the couple donated another $2 million for upgrades to the fieldhouse and the area surrounding it. O’Shaughnessy, who played two seasons, was one of the top defensive players ever to don a Knights uniform. He recorded 22 career sacks, including a still-standing school record for sacks in a game with five against Emory & Henry. 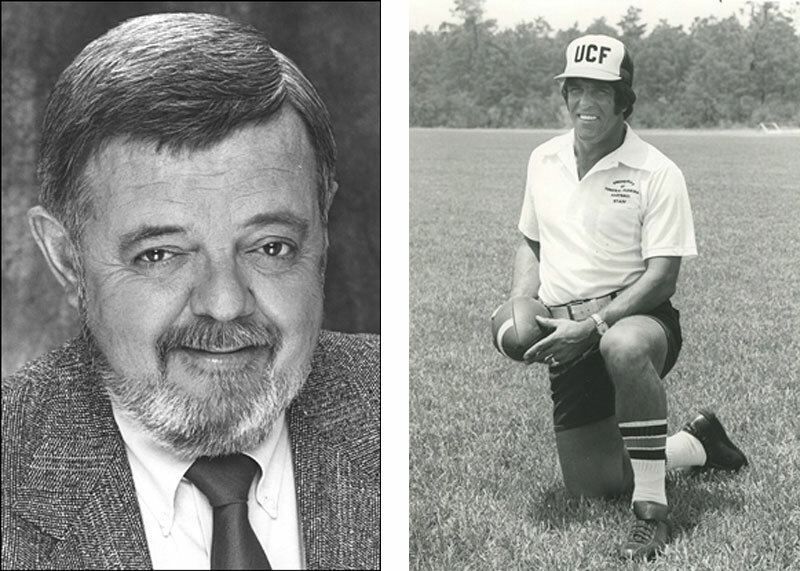 He was named UCF’s Alumnus of the Decade for the 1980s and was inducted into the UCF Athletics Hall of Fame in 2010. A competitor at heart, O’Shaughnessy is also a Guinness world-record holder in the sport of paddle boarding, a four-time East Coast Paddle Board Champion and a six-time Florida State Paddle Board Champion. He and his wife, Leslie, co-founded the Millennium Woman Foundation, a nonprofit organization that has funded more than 250 educational scholarships to single-parent women nationwide. There was a lot of “say what?” when Winter Park High School quarterback Steve Moffett turned down advances from the University of Georgia and other A-list programs to play for UCF. But a big change eventually came. Coach Mike Kruczek, who recruited Moffett, was fired late in the 2003 season. With Kruczek — who’s now head coach at Trinity Prep — went the spread offense playbook that attracted Moffett to UCF in the first place. Then in came crusty George O’Leary and his old-school I-set. 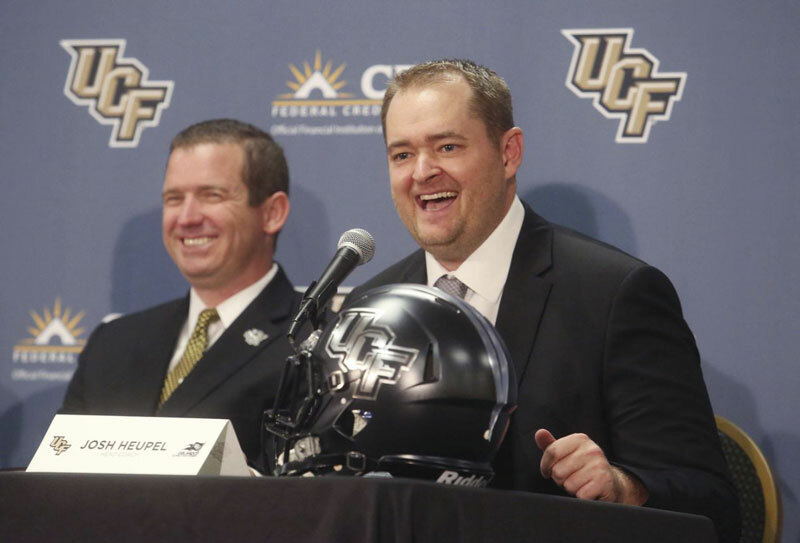 Danny White, UCF athletic director (left), and Josh Heupel, UCF head coach (right), are both Winter Park residents — and proud of it. White hired head coach Scott Frost, who delivered a mythical national championship only to bolt for the University of Nebraska in 2017. White then turned to Heupel, who coached the Knights to another undefeated regular season and finished third in the balloting for Associated Press Coach of the Year. “O’Leary said I wasn’t worth [expletive] and I’d never play here,” Moffett told the Orlando Sentinel in 2008. Still, he led UCF to its first-ever bowl game (Hawaii Bowl, 2005) and is No. 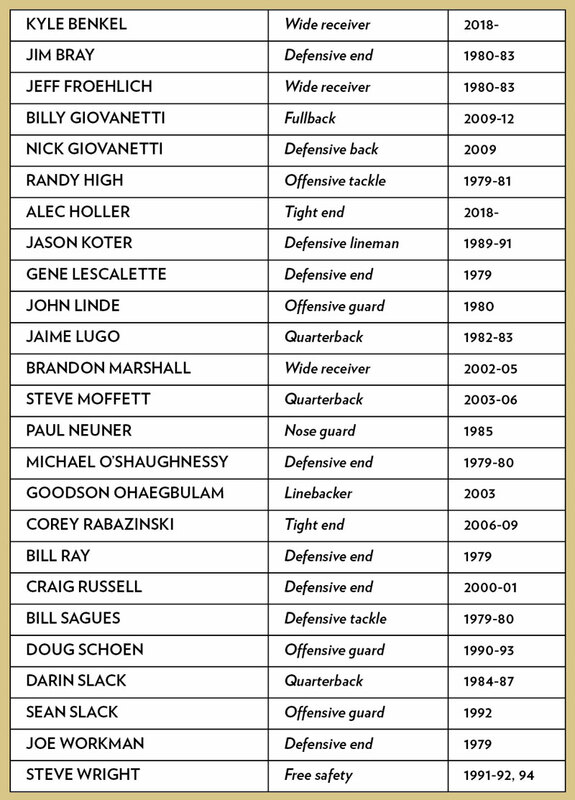 5 on the all-time UCF list for completions (510), No. 7 in career yards (6,199) and tied for No. 7 in touchdown passes (41). Tony Nicholson has never played a down for UCF. But he’s a big-time game-changer. He was a decent high school player back in Chicago but found success in other endeavors after graduating from Tulane University and moving to Central Florida in 1967. A multifaceted entrepreneur and real estate developer who has also produced concerts, invested in Broadway shows and published magazines, Nicholson and his wife, Sonja — who owns Re/Max Park Avenue — have philanthropic hearts that have helped keep UCF ticking all these years. “I’ve lost a lot of friends at Tulane because of it, but in the meantime I’m very happy,” Nicholson says. In 1996, the Nicholsons pledged $2 million to the university, which named its School of Communication in their honor. They donated a cumulative $2 million for construction of the Nicholson Fieldhouse, the state’s first indoor practice facility for a college football team. But they weren’t finished. In 2017, the couple donated another $2 million for upgrades to the fieldhouse and the area surrounding it. Nicholson believes the future for UCF football is bright and is already talking up the need to expand Spectrum Stadium. Any guesses on who’ll be the first to step up? Keith Benkel and Kyle Benkel are generational bookends. Father and son share the same DNA, of course, which in this case includes blood ties to Winter Park and UCF. Keith grew up in North Miami Beach and found his way to UCF as a walk-on wide receiver in 1986. Walk-ons do all the dirty work, helping the starters prep for the weekly scrums by playing on the scout team. He didn’t play much, although he traveled with the team between 1987 and 1989 and played on special teams during his last two seasons. Now national used car director with the Greenway Automotive Group in Orlando, Keith remains a loyal UCF supporter. He also serves on the executive board of the UCF Lettermen’s Club (which was founded by O’Shaughnessy). But ties with the university run deeper than that because of Kyle, 21, a walk-on wide receiver. The fact that Kyle was valedictorian at Winter Park High School in 2016, notching a perfect 4.0 GPA, is of little relevance on the football field. It’s a different competition there, where smarts are just part of a package that includes speed and strength. At 5-foot-9 and 184 pounds, Kyle won’t intimidate a lot of cornerbacks. Keith and Kyle are proud to have played roles in establishing that tradition, even if their numbers haven’t been called all that often. After all, contributing can also mean offering encouragement and inspiring others by giving it your all — regardless of where your name appears on the depth chart. Paul Lounsberry is a UCF lifer. Please consider that a compliment. The record shows that Lounsberry coached the offensive line, along with some special-teams work, from 1987 through the spring of 2000. He then coached at Winter Park High School from 2013 until his retirement in 2016. But he’s still a presence at both campuses, connecting the dots between the UCF program and Winter Park. In fact, Lounsberry still doesn’t miss a UCF game or a practice. He’s always working the sidelines, offering encouragement, wisdom and perspective to a new generation of players. He can spread the word about Daunte Culpepper, who was a 10th-grader in Ocala when Lounsberry began recruiting him. He even helped arranged tutoring for the talented youngster to ensure that low grades and SAT scores wouldn’t endanger his eligibility. 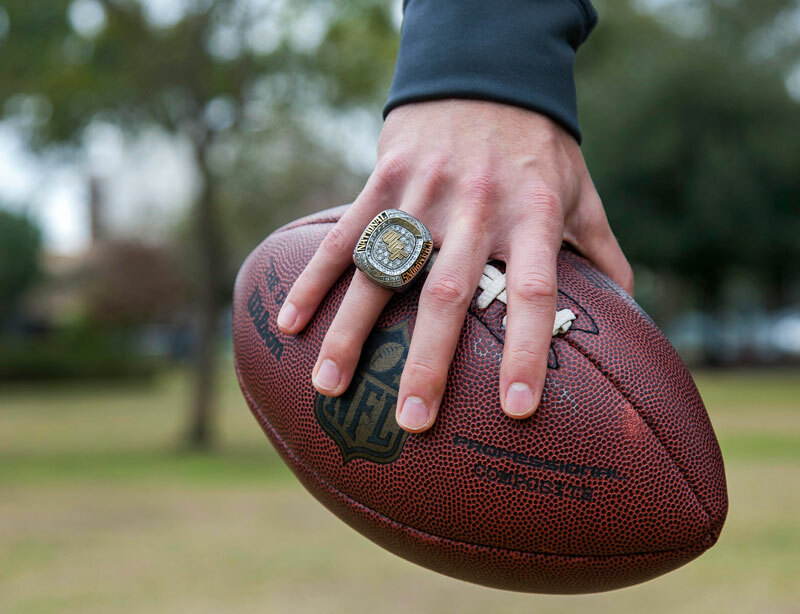 He can tell them about other players he recruited and coached, including Mike Gruttadauria, who won a Super Bowl as a starting center with the then-St. Louis Rams. He can tell them how tough it was to keep the program going back in the days when he and other assistants had to park cars as valets to pay their monthly bills. Now, he looks around in amazement. After the perfect 2017 campaign, when head coach Scott Frost left for the University of Nebraska, he wondered if the momentum could continue under new head coach Josh Heupel. Yet, Heupel led the Knights to another undefeated regular season and an American Athletic Conference Championship. A horrendous knee injury to starting quarterback McKenzie Milton against the University of South Florida undoubtedly contributed to the Fiesta Bowl loss versus LSU. Come to think of it, maybe the official municipal slogan should be changed to the City of Culture and Heritage and Football. Has a nice ring to it, don’t you think? After playing football at UCF and three seasons with the USFL, Ed Gantner won fame as Ed “The Bull” Gantner, a professional wrestling heel. 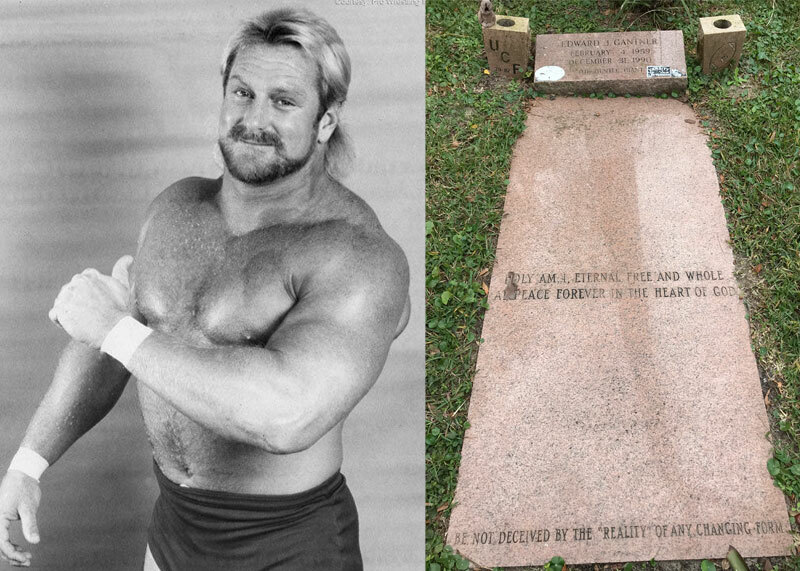 Gantner, tormented by personal demons and debilitated by years of steroid use, committed suicide in 1990 and is buried in Winter Park’s Palm Cemetery. The “giant” descriptor was certainly accurate — Gantner was 6-foot-4 and, at his peak, tipped the scales at a muscular 300 pounds. But to anyone who encountered him on the football field or in the wrestling ring, the word “gentle” likely didn’t come to mind. “Big Ed” Gantner, who played high school football at Edgewater, was a defensive tackle and a holy terror for opposing players who lined up against the first UCF squad. Although Gantner had been offered a football scholarship at the University of Tennessee, he spent less than a year in Knoxville before becoming homesick. He returned to Orlando and worked as a bartender and a bouncer before hearing that UCF was forming a football team. The fledgling Knights needed Gantner and he needed the Knights — a squad made up of other high-school jocks who, for one reason or another, the big schools had ignored or rejected. How important was UCF to Gantner? On opposing sides of his headstone are two markers, one of which shows the outline of a football with his jersey number, 75, etched inside its contours. The other marker reads “UCF 79-82,” which in retrospect may have been the best years of his tumultuous life. After starring at Edgewater and playing three seasons for UCF’s inaugural teams, Gantner, along with teammates Bill Giovanetti and Mike Sommerfield, was signed as a free agent by the Tampa Bay Bandits of the United States Football League. Gantner was the lone Knight remaining by the end of the first training camp, held at Tampa’s Hillsborough Community College. He then became the first UCF player to turn pro. His USFL run would last three seasons, in 1993 with Tampa Bay — coached by Steve Spurrier — and 1984 and 1985 with the Jacksonville Bulls. Joining the Orlando Renegades for 1986 was an option, but rumors persisted that the league might fold before the fall schedule began. The uncertainty compelled Gantner to call legendary wrestling promoter Eddie Graham and join his Tampa-based Championship Wrestling from Florida organization. He was trained by wrestling icon Hiro Matsuda and assigned to a stable of colorful grapplers “managed” by the villainous Sir Oliver Humperdink. Gantner had the size and the athleticism — as well as the outsized personality — needed to succeed as a heel (a bad guy) in the world of pro wrestling. Even 30 years ago, wrestling was understood by most to be scripted — but it was no less physically demanding and dangerous than most contact sports, including football. Billed as Ed “The Bull” Gantner, he rose up the ranks to become National Wrestling Alliance Florida Heavyweight Champion in 1987. But anabolic steroids — which he had used since high school — had begun taking a frightful toll on his body and mind. Gantner’s kidneys shut down and he would eventually need a transplant. His sister Deborah proved to be a match, and the surgery was performed in 1989. The Winter Park/UCF community stepped in to help as well. Although the kidney transplant was successful, Gantner continued to battle the demons of depression and other mental health issues. He committed suicide by shooting himself on New Year’s Eve, 1990. He was 31 years old.